Bloody awesome NC. I'd never have known that surfboard move (with a non conscious person). 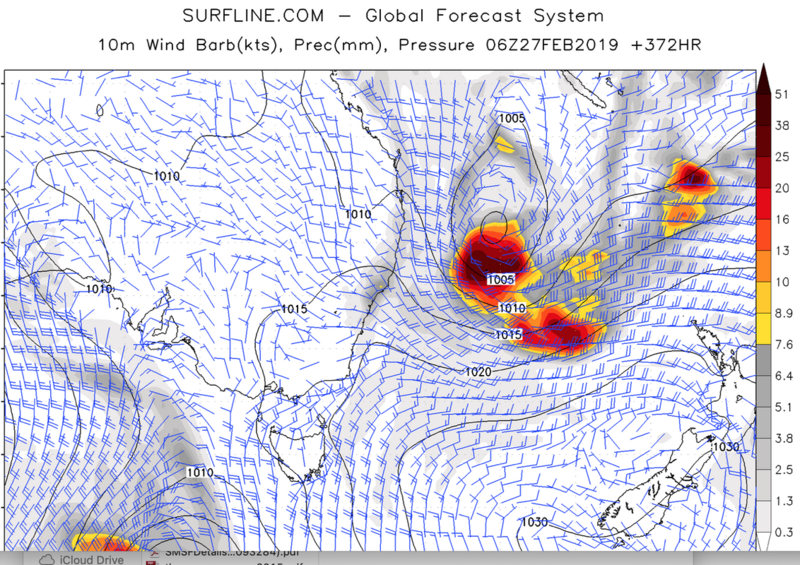 This low is a redeveloped tropical cyclone that is progged to begin way the hell out near the Cook Islands, intensify as it moves south of Fiji, and carry all the way to where it is on this map. It aims a broad band of ESE and ENE winds at the whole Australian east coast for a period of several days. If this happens, everywhere will be hammered by one of the best easterly swells of the century along with light to mod-fresh SW/SE winds. yeah do. it's worth it. yeah, t'was a good presentation. particulary the fact size and strength aren't essential - good use of young'ns to demonstrate this. And the most important advice, applicable to so many emergency situations, stay calm, don't rush into things. This should be the fist response in any critical situation. And, using a victims own mass (leverage) to lift or move them - utilising the board in a surf zone as shown, or a couple of lengths of rope each end (upper and lower body) as leverage into a boat, is a handy skill. his new nickname will be Two Rope Trev. You'll have to rescue me from the headland with my camera. I'll have to check charts but didn't TC Gita sit in a similar position and was hyped yet delivered bugger all. No wind band like the one illustrated by that weather map would deliver bugger all. Like - look at the wind band east of the low. 35-knot winds blowing across a fetch maybe 700nm long and similarly wide. Remember this fetch has been moving toward the Aust coast for five days. The swell generated by such winds would have a top end period of 17 seconds and be anywhere from 10-12’ in the open ocean. But it’s a way the fcuk out there prog so it doesn’t count yet. I'd like to see what Longtard has to say about this. Like four years before this was shot, pretty much every surfer in the world was riding loggers. Now, MP, 19 years old and just crackling with energy and style, is lining up Kirra like a gunslinger. You can just smell the surfing being invented as it happens on screen. It's funny eh Alby just kind of stumbled across the day this was shot, it wasn't set up at all. And the ftg is not at all nostalgic, it's just kind of raw and brilliant. Oh dear, Nicks binge watching Morning of The Earth. How will this end? I mean drailed stand up for god's sake. Loofy laughing and Nick biting. It was a guaranteed result.